Get rid of paperwork and deal with all documents electronically. Biometric signatures which, under the applicable legislation, fully replace signatures by hand, save both finance and time. Visible digital signatures bring significant cost savings, quicker ROI and increased security. The positive ecological impact is also worth mentioning. Biometric signatures under the applicable Czech legislation fully replace signatures by hand. You can use them to sign contracts, invoices, requests, offers, and other documents. The solution uses specialized hardware (signature pads or signpads) or regular tablets..
We offer the integration of biometric and electronic signature solutions from SignoSoft, a leader in this field. The cost of dealing with fully electronic documents is up to 85% lower than dealing with the paper forms. 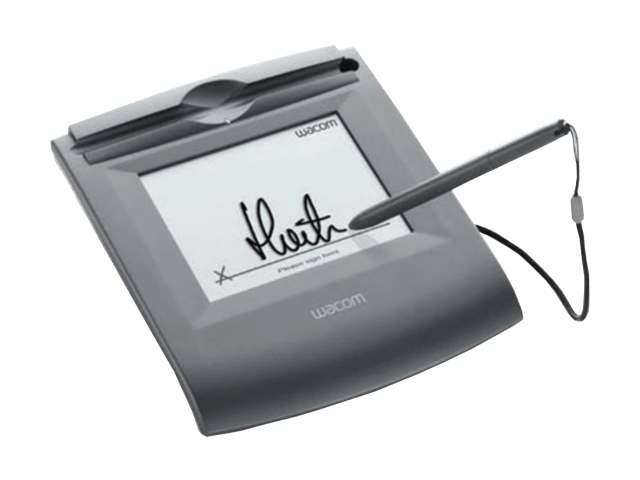 A biometric, or visible digital, signature is used to sign electronic documents safely. It combines a number of parameters such as speed, acceleration, pressure, or signing time. This guarantees the originality and uniqueness of the person’s signature. Thanks to the attached visible digital signature, signed documents are secure and ready for immediate processing. In addition, they look just like the documents in paper form, whether they are invoices, contracts, requests, or offers. One document may be signed by multiple people. It can also be used in together with an electronic signature or a qualified certificate. The implementation of biometric signature technology is fast, simple, and does not require any special training. It is also possible to verify the handwritten signature on an electronic document. WHY TO USE BIOMETRIC SIGNATURES?